We urge you to immediately stop construction of the naval base and protect South Korea's democracy by ending the violent crackdown on protesters. We stand with the residents of Jeju in their non-violent efforts to protect the island’s rich marine ecosystems and preserve peace in this increasingly fragile and militarized region. Two days ago, construction began on a new and massive U.S. naval base on Jeju Island. 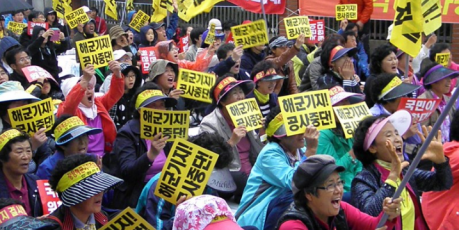 Right now, as dynamite is blasting rocks into the air, Jeju citizens have taken to the streets to voice their outrage and if we join with them in a national outcry we can help stop the devastation. Jeju Island is so magnificent it’s being considered as one of the 7 natural wonders of the world, but the South Korean and US governments want to build a massive naval base and launching pad for ballistic missiles. Fearing national outrage, the government has suppressed the story and police are intimidating brave protesters to drop their resistance. But this is an election year -- if we can show President Lee that this will influence votes, we have a real chance in halting the destruction.